Edgartown Town Hall is located at 70 Main Street, Edgartown, MA 02539; phone: 508-627-6110. 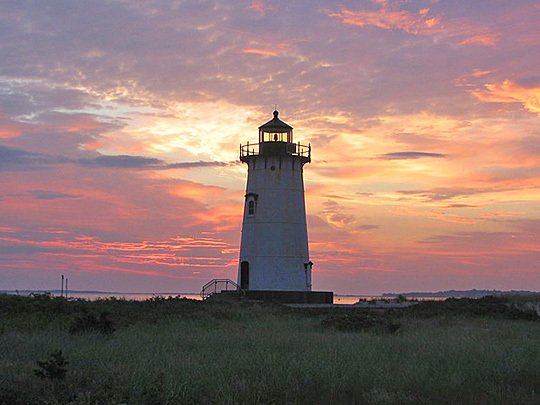 Photo: Edgartown light, Edgartown, MA near North Water Street, photographed by Robert Gagel, 2006, en.wikipedia.org, accessed February, 2011. The beginnings of the history of Edgartown took place in Watertown, when, on March 16, 1641-1642, the grant of township was made by the two patentees, Mayhew, Senior and Junior, unto five of their townsmen, and the first foundations were laid in that year when young Thomas Mayhew set foot on the shores of its "great harbor," with his companions, to consummate the title and take possession. The identity of the passengers who came in that first shallop to Great Harbor in 1642 as companions of young Mayhew is yet unknown. Speculation may be indulged in to the extent of supposing that some of the original grantees of Watertown came to look over their deed of gift, but we know of these only John Daggett remained to become a settler, and he may be included with the first contingent. To these we may add John Folger, John Smith (John Bland), possibly Edward Sales of Rehoboth, and others. Such was the beginning of the first settlement by the Mayhews and their associates, and little that they did in the early years of the plantation is known. When they landed, they found groups of Indians under the leadership of Tewanquatick, Sagamore of Nunnepog, for such was the Algonquin name for the place which Mayhew chose for the town site. The Indian name for the territory now comprising the present bounds of Edgartown is the only one which was attached to the sachemship of the eastern half of the Vineyard. It occurs in various forms: as Nunpauket, Nunpaug, Nunpog, and in an Indian deed of 1684 it is written Unnunpauque, and on another of 1696, Wonottaquan, squaw sachem of Nunpawquit, sold land situated on the east side of Watchusate neck. The meaning of the word is "fresh pond or water place." Just what particular pond gave its character to the sachemship of Nunnepog is a matter of speculation, but it was probably the Great Pond, on the shores of which the Mashakemmuck, or Great House of the sachems of this territory. The basis of all land titles in Edgartown rests upon the original grant of the two Mayhew patentees, to certain individuals including John Daggett, Daniel Pierce, Richard Beeres, John Smith and Francis Smith. For the first few years after settlement of the town, no name was formally bestowed upon it, as it was the only place upon the island inhabited by the whites and it needed no distinguishing title. In all the extant correspondence of the elder Mayhew, during that early period, his letters were uniformly dated as "Uppon the Vyneyard" or "the Vyneyard" simply, while contemporary legal instruments referred indefinitely to the "Towne uppon the Vineyard." The name of Great Harbor first appears in 1642 in the town records as the title of the settlement now comprised in the territory of Edgartown, but even ten years later in a suit prosecuted by John Daggett at Plymouth the legal entry of it was made as Daggett vs. "the towne of the dais Vineyard." As the population increased and new settlers began to occupy West Tisbury and Chilmark, the necessity for a distinctive nomenclature was felt, and Great Harbor began to be applied slowly to the settlement at Edgartown. The newer village was called Middletown, being close to the Island's center. The name Edgartown was not adopted until some 20 years later. Charles Edward Banks, M.D., The History of Martha's Vineyard, Dukes County Massachusetts, Volume II, George H. Dean, publisher, Boston, 1911.